a. For mandibular anterior occlusal radiographs, position the patient so that the ala-tragus line is at a 45° angle with the floor, and the midsagittal plane is perpendicular to the floor. b. For mandibular posterior occlusal radiographs, position the patient so that the ala-tragus line and mid-sagittal plane are perpendicular to the floor. 3. 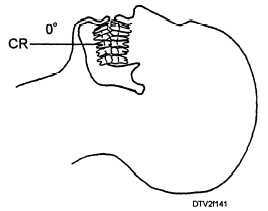 Place the film packet in the patient's mouth with the pebbled surface toward the occlusal surfaces of the mandibular teeth, and the short sides of the packet are toward the patient's cheeks. Have the patient close gently on the packet to hold it in place. 4. Position the tube head. a. 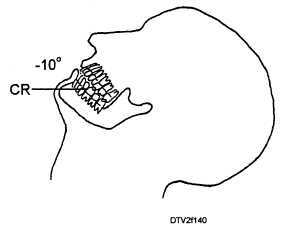 For mandibular anterior occlusal radio- graphs, set the vertical angulation of the tube head at - 10°. Center the tube head cylinder on the tip of the patient's chin so that the central X-ray beam will be projected as shown in figure 1-40.
b. For mandibular posterior occlusal radiographs, set the vertical angulation of the tube head at 0°. Center the tube head cylinder beneath the patient's chin so that the central X-ray beam will be projected as shown in figure 1-41. Figure 1-40. - Projection of central ray (CR) for mandibular anterior occlusal radiographs. Figure 1-41. - Projection of central ray (CR) for mandibular posterior occlusal radiographs. patients, dental personnel must maintain infection control standards in the radiology area similar to those used in the DTR. Information and procedures on the Dental Infection Control Program can be found in BUMEDINST 6600.10. Follow rigid handwashing procedures when treating a radiology patient. Wear gloves when placing intraoral films and handling contaminated film packets. Disinfect all counter surfaces daily, and any other areas that might become contaminated such as doorknobs, light switches, and other surfaces that you might come in contact with. Film positioning devices should be disposable (single use) or heat sterilized between patients. Your command should have an adequate supply of film positioning devices to treat your daily patient load. If supplies are short, you may disinfect film positioning devices between patients by immersion in an EPA- registered chemical disinfection such as a 2 percent glutaraldehyde. Rinse thoroughly after disinfection. Follow manufacturer's instructions for high-level disinfection. Use a disposable panoramic unit bite block cover for each patient. When disposable covers are not available, disinfect bite blocks as you would a film holding device.